Medievalists and medieval enthusiasts have no doubt encountered stories of lovers who reach an impasse between their affections for each other and deeper, more personal obligations that they may hold, whether an obligation to another, to an institution, or to God. We might think, for example, of the end of Marie de France’s Eliduc in which Guildeluec and eventually Guilliadun take the veil and Eliduc joins a monastery. The very end of the Arthurian cycle also comes to mind in which both Guinevere and Lancelot commit themselves to the religious life (though this is after much grave harm has been done). One may even be reminded of the real-world historical figures of Abelard and Heloise, albeit unfortunate circumstances abetted certain choices in their life stories. All of these narratives deal with themes that can be found in a much older tale, though this is not in any way to suggest lines of influence. While lacking the supernatural, adventurous, and tragic elements of other Old Irish love narratives—Cú Chulainn for Fand, Deirdre for Naoise, Gráinne for Diarmuid—the Comrac Líadaine ocus Cuirithir tells a tale—for all intents and purposes based on historical persons—that at once demonstrates its inheritance to traditional Irish love stories as well as concerns that we see reflected in a host of medieval European literatures. 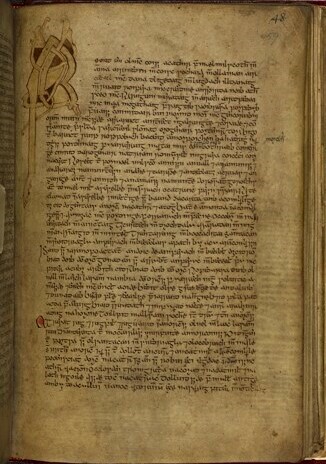 As with most Old Irish literature, the manuscripts that preserve the account of Líadain and Cuirithir date much later. Only two contain the story: Dublin, Trinity College Library, MS 1337, p. 759 (olim H. 3. 18) (15th-16th centuries) and London, British Library, MS Harley 5280, f. 26 (16th century). London, British Library, MS Harley 5280, f. 59. While this folio does not contain our text, note the decorated initial and script used. There is evidence, however, that the couple and text were widely known among Irish literati. As the work’s early editor, Kuno Meyer, notes, there is a reference to Líadain as a renowned poet in the introduction to “The Lament of the Old Woman of Beare,” and a tenth-century metrical treatise offers one of her stanzas in our text as an example of treochair metre (8-9). Given that the preservation of much of Old Irish literature can be attributed to Christian churchmen (the same is also true for other pagan literatures), some of the Christian themes in the story have been thought overlays. For example, in the forward to her translation of the text, Moireen Fox refers to “acts of pious vandalism” enacted against ancient works, the forcing of “old legends into the boundaries of the new faith” (7). Be that as it may, thinking of an earlier, “pure” literature as somehow sullied by Christian influences short-changes the vibrant, syncretic culture that preserved it—a culture that one sees refracted through Líadain and Cuirithir’s lives. What we have in the Comrac Líadaine ocus Cuirithir is a narrative that relates the following. Recounted in prosimetrum form, we learn that Líadain, a celebrated poet from Corkaguiney, a barony in County Kerry that comprises most of the Dingle Peninsula, is on tour in Connacht. 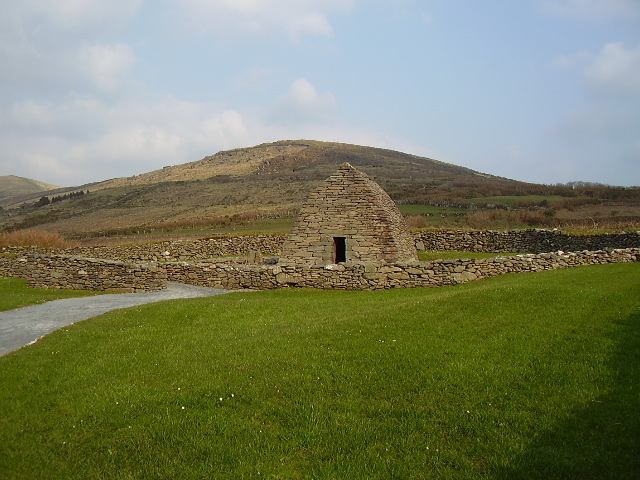 Gallarus Oratory on the Dingle Peninsula. Photographed by Hannah Zdansky. While there, she meets Cuirithir, also a poet—both likely lived in the seventh century—with whom she falls in love. Cuirithir urges that they unite, saying that if they had a son, he would surely be famous, but Líadain resists. She does not want her agreed-upon schedule of travels and literary engagements jeopardized. Instead, she tells Cuirithir that once she has finished, he can leave Connacht to come visit her at her home. 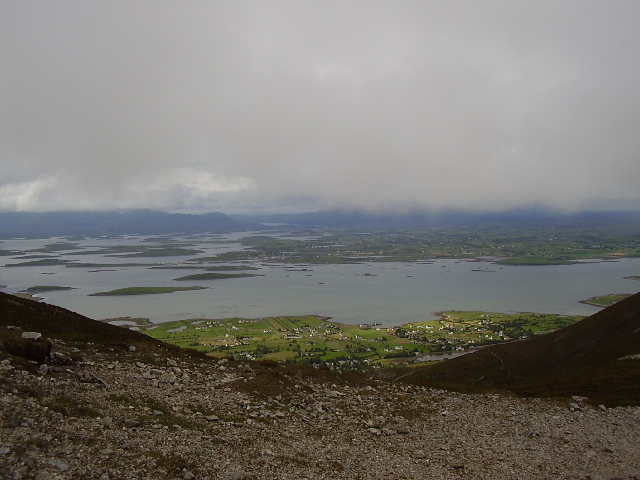 Clew Bay from atop Croagh Patrick, Co. Mayo (Connacht). Photographed by Hannah Zdansky. When Cuirithir finally heads south to meet Líadain, he accompanies her to the religious man Cummaíne Fota, and they place themselves under anmchairde, ‘soul-friendship’ (cf. Lat. amicitia). Though the text is sparse in the details, one can infer that this is Líadain’s idea. This notion of soul-friendship is something treated often in later theological treatises, and we can think especially of St. Aelred of Rievaulx (c. 1110-1167). Spiritual marriage, as a concept, becomes a repeated theme in hagiography and in the lives of religious women, especially during the High and Late Middle Ages. What is so intriguing about the story of Líadain and Cuirithir is how early it is—ninth or the beginning of the tenth century. One can only guess at the reasoning behind Líadain’s decision to become a nun. Perhaps it was entirely religious. Perhaps she also did not want to give up her intellectual and artistic calling to have child after child—a valid response that women of different cultures and time periods during the Middle Ages shared. One need only peruse a work like Hali Meiðhad to catch a glimpse of how motherhood was perceived by some. I dare not welcome it! ascnam sech péin hi pardos. fris-seom ba mór mo míne. fris-som ba maith mo gnás-sa. The text clarifies afterwards that “how she had wrung his heart was the haste with which she had taken the veil” (27). When Cuirithir hears that Líadain is searching for him, he takes to the sea and travels to distant lands to continue his pilgrimage. They never see one another again. While we could view Cuirithir’s harsh parting as vengeful, it could also be attributable to a wish to help both of them live out their vows—though these are vows upon which Líadain insisted. However, Líadain’s feelings towards her earthly love never diminish: “The flagstone upon which he was wont to pray, she was upon it till she died. […] And that flagstone was put over her face” (27). We are reassured, though, that her soul is in Heaven. But with her strength, intellectual abilities, and renown also came great sorrow, a sorrow she was never able to overcome. For the edition and translation utilized here, see Liadain and Curithir: An Irish Love-Story of the Ninth Century. Ed. and Trans. Kuno Meyer. London: D. Nutt, 1902. Available online here: https://books.google.com/books/about/LIADAIN_AND_CURITHIR.html?id=qkNT8Th48DsC&printsec=frontcover&source=kp_read_button#v=onepage&q&f=false. See a catalogue description of the manuscript here: https://www.vanhamel.nl/codecs/Dublin,_Trinity_College,_MS_1337. Some of the manuscript, which has been split into different volumes, is available here: https://www.isos.dias.ie/english/index.html. However, our tale has not yet been digitized. 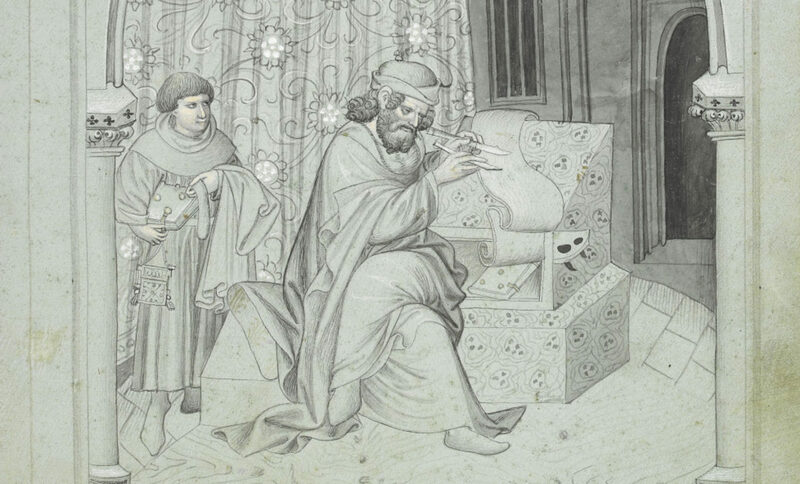 See a catalogue description here: https://www.bl.uk/catalogues/illuminatedmanuscripts/record.asp?MSID=7375&CollID=8&NStart=5280. See Liadain and Curithir. Trans. Moireen Fox. Oxford: B. H. Blackwell, 1917. “Inmain guthán rocluniur, / fáilte fris nocho lamur, / acht is ed atbiur nammá: / is inmain in guthán sa” (18). “Guth domadbat trie clethae / is maith dó domincrechae: / is ed dogní frim in guth, / nachomléci do chotlud” (18). “Is é didu crád dorat sí fair-som a lúas rogab caille” (26). “Ind lecc fora mbíd som ac ernaigthe, robói sí for inn leicc sin co n-erbailt sí […]. Conid ind lecc sin dochóid dar a hagaid-si” (26). “A ben cosind remorchois, / ní fúar do ṡét di márchlois, / nícon festor fo chailliu / banscál badid cíallaidiu” (16). For further studies, see those listed here: https://www.vanhamel.nl/codecs/Comrac_Liadaine_ocus_Cuirithir.